Ballard, J. G. The Drowned World. New York & London: WW Norton, 2012 . Bateson, Gregory. ‘The Cybernetics of “Self”: A Theory of Alcoholism.’ Psychiatry 34 (1971): 1–18. Bruce D. Smith, ‘The Onset of the Anthropocene.’ Anthropocene 4 (December 2013): 4–6. Connolly, William E. Politics and Ambiguity. Madison: University of Wisconsin Press, 1987. Derrida, Jacques. ‘Plato’s Pharmacy’, in Disseminations, trans. Barbara Johnson, 65–119. Chicago: University of Chicago Press, 1981. French, Lindsey. ‘Biologic Mediations Panel.’ Lecture. Ambiguous Territory Symposium. October 6 2017. Guattari, Félix. Chaosmosis. Translated by Paul Bains and Julian Pefanis. Bloomington: University of Indiana Press, 1995. Haraway, Donna. Staying With the Trouble, Making Kin in the Chthulucene. Durham NC: Duke University Press, 2016. Morton, Timothy. Dark Ecology. Columbia University Press, 2016. Rancière, Jacques. ‘The Aesthetic Dimension: Aesthetics, Politics, Knowledge.’ Critical Inquiry 36, No. 1 (Autumn 2009): 1-19. Steffen, Will, Jacques Grinevald, Paul Crutzen, and John McNeill. ‘The Anthropocene: conceptual and historical perspectives.’ Philosophical Transactions of the Royal Society, 369 (2011): 842-867.
van der Vorst, Jack G.A.J., and Joost Snels. Multi-Donor Trust Fund for Sustainable Logistics (MDTF–SL) Position Note on Agro-Logistics. Washington, DC: World Bank Group, 2014. Vidler, Anthony. The Architectural Uncanny: Essays in the Modern Unhomely. Cambridge, MA: MIT Press, 1992. Kathy Velikov is an Architect, Associate Professor at University of Michigan’s Taubman College, and current President of ACADIA. She is founding partner of RVTR, a platform for experimentation in the agency of architecture and urban design within the context of dynamic ecological systems, infrastructures, materially and technologically mediated environments, and emerging social organizations. She is a recipient of the Architectural League’s Young Architects Award and the Canadian Professional Prix de Rome in Architecture. Most recently “Infundibuliforms” received a 2016 R+D Awards honorable mention from Architect Magazine and she collaborated on EXTRACTION, the Canadian Pavilion for the 2016 Venice Architecture Biennale. Writing and project publications include the journals JAE, IJAC, Leonardo, New Geographies, eVolo, Volume, OASE, and MONU, and the books Infrastructure Space, Hypernatural, Paradigms in Computing, and [bracket] Goes Soft. Kathy is co‑editor of ACADIA 2016: Posthuman Frontiers (2016) and co‑author of the book and traveling solo exhibition Infra Eco Logi Urbanism (2015). Cathryn Dwyre is coprincipal of the experimental design practice, pneumastudio, and Adjunct Associate Professor of Architecture at Pratt Institute’s School of Architecture where she teaches undergraduate thesis and elective seminars. Dwyre holds a Master of Landscape Architecture from the University of Pennsylvania and previously received a B.A. from Colgate University, with a double major in Geology and Philosophy. Prior to joining the faculty at Pratt Institute, Dwyre was the Managing Editor of ViaBooks with a volume published by MIT Press entitled Dirt. She is coeditor of a special issue of PAJ: A Journal of Performance and Art (MIT Press) and recipient of the MacDowell Colony Fellowship. pneumastudio has exhibited at the Storefront for Art and Architecture in New York City, the Onassis Cultural Centre in Athens, Greece, the Design Museum in Barcelona, and NYU’s Gallatin School of Individualized Study. Recent publications featuring pneumastudio include Global Design (Prestel) and XXLXS: New Directions in Ecological Design (Actar). Chris Perry is coprincipal of the experimental design practice, pneumastudio, and Associate Professor at Rensselaer Polytechnic Institute’s School of Architecture where he is Associate Dean for Graduate Education, Director of the MSArch program, and coordinator of undergraduate thesis. Prior to joining Rensselaer, Perry was the Louis Kahn Visiting Assistant Professor at the Yale School of Architecture. Perry is a recipient of the Architectural League of New York’s Prize for Young Architects and The MacDowell Colony Fellowship. He was cochair of ACADIA’s 2015 Annual Conference, coeditor of its proceedings, and is a member of its Board of Directors. Perry is coeditor of Collective Intelligence in Design (WileyAcademy), editor of a monograph of his first design practice, servo: networks and environments (DAMDI Publishing), and coeditor of a special issue of PAJ: A Journal of Performance and Art (MIT Press). Perry received a Master of Architecture from Columbia University with an Honor Award for Excellence in Design. David Salomon is an Assistant Professor of Art History at Ithaca College, where he is also the coordinator of the Architectural Studies program. He is the coauthor, with Paul Andersen, of The Architecture of Patterns (Norton, 2010), which received a production grant from the Graham Foundation. His wideranging research has been published in Grey Room, Log, Harvard Design Magazine, Places, The Journal of Landscape Architecture and the Journal of Architectural Education. 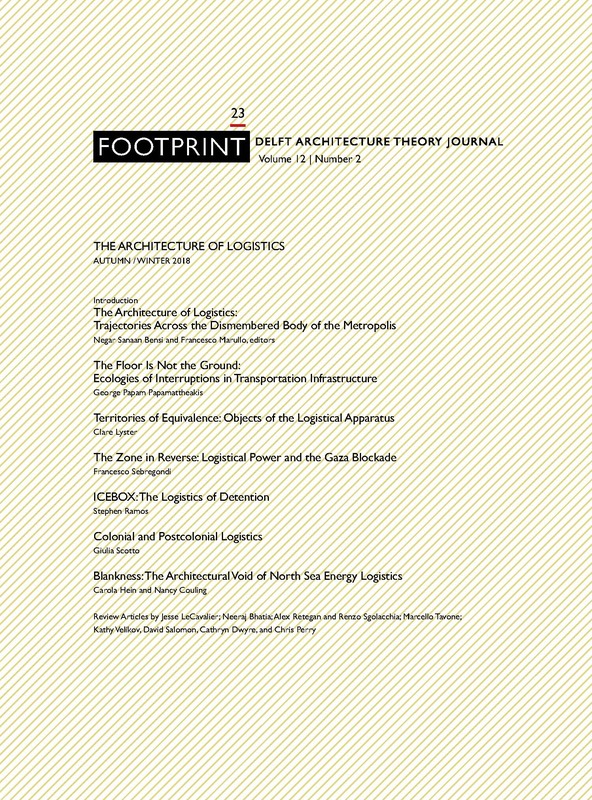 Forthcoming publications include a book on the history of symmetry in architecture, math and science (DiTella, Buenos Aires) the history of the driveway (Buildings and Landscapes) and the relationship between Michael Heizer’s land art, bulldozers and suburban tract developments (Journal of American Culture). He was the recipient of the Carter Manny award from the Graham Foundation for his PhD dissertation One Thing or Another: The World Trade Center and the Implosion of Modernism. David is a graduate of UCLA’s Critical Studies in Architecture Culture program. VELIKOV, Kathy et al. Ambiguous Territory. FOOTPRINT, [S.l. ], p. 147-160, nov. 2018. ISSN 1875-1490. Available at: <https://journals.open.tudelft.nl/index.php/footprint/article/view/2054>. Date accessed: 21 apr. 2019. doi: https://doi.org/10.7480/footprint.12.2.2054.